Doimaj, also known as Dogmaj, is a common traditional snack which people in some Iranian provinces eat during the warm seasons. Doimaj is a combination of pieces of bread, cheese, vegetables, walnut, fried onions, and turmeric. During the holy month of Ramadan, it is usually served for Iftar to break the fast. First, thoroughly crush the breads into a large bowl and add a cup of water (or less) to it and mix it carefully. Cut and add the cheese. Add fried chopped onions and shredded walnuts as well as vegetables to it and mix with your hands. Leave the mixture in the kitchen for one or two hours to be easily formed by hand. After a while, squeeze the material in your hand in round or oval forms until it fits completely and does not break apart. If it breaks apart, add some water. Doimaj is considered a traditional Azarbaijani food usually prepared for breakfast and evening meals, and if served along with summer fruits (grapes and watermelons), it becomes tastier. There is no mint or yogurt in its ingredients, but you can serve it with a bit of creamy yogurt and mint. 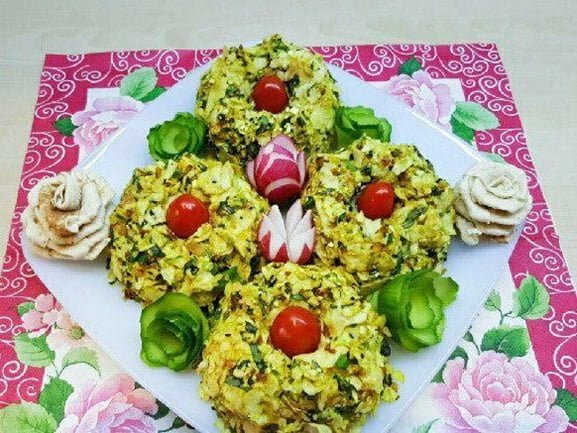 In Qazvin, Doimaj is prepared using turmeric and sautéed onions. If you wish, add a little cucumber, hogweed, and mint. You can also add some grated garlic or garlic powder to Doimaj.